A paranormal story, a romantic suspense, and a space opera (you’re welcome!). In the three new edgy romances below, our featured heroines are on top of their games, and our heroes are smoking hot. And how do we know this? Because our narrators are equally on top of their games and just as smoking hot! 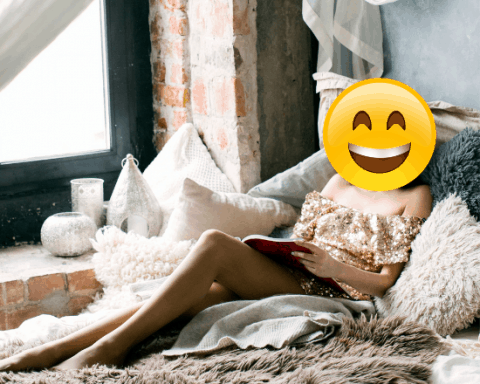 The combination of chills and thrills and that narrator-driven intimacy factor will remind you (as if you needed it) why audiobooks are the best way to experience your favorite stories. You’ll love this adrenaline-filled listening. I don’t mean to be a doubter, but I went into this audiobook honestly wondering how narrator Jim Frangione could possibly best his performances on books one through sixteen (recommended, all!) of J.R. Ward’s epic (and epically long) Black Dagger Brotherhood series. Surprise on me! This is a delightful gem which — thanks to author Ward — sports a humble hero (Murhder) with a story that actually can stand alone and — thanks to Frangione — feels heart-wrenchingly genuine. There’s a tightly paced mystery with a human scientist and a couple of other vampire story threads that weave together. Frangione’s storytelling chops kept my interest 100% engaged over many hours of listening. I know you have sixteen other audio choices in this series, but this one’s worth your time. And Murhder’s story is long awaited by fans. I’m jealous of our reviewer who landed this title because I’m fond of science fiction romance, and I’ve enjoyed Bouchet’s fantasy series. So trust me when I say you’re in for a treat! And, as if you needed more reasons, it’s narrated by Susan Bennett. If you don’t know Bennett’s narrative skills, I would describe her as versatile and romantic without being fluttery. She keeps her stories grounded, which is perfect for an outer space adventure where gravity can be an issue. Tess Bailey and her galactic crew are desperate, but desperate enough to trust Shade Ganavan’s help? Listen and find out. Texas accents and Mexican Spanish? This book was made for audio, thanks to the vocal agility of narrator Ryan Turner. Entrepreneur Harper hires security agent Chase to look for her brother, who went missing during a sailing trip. They soon find themselves attacked by mercenaries and relying on each other for more than just survival. Steamy love scenes and tense escapes are equally well wrought by Turner. There are also some plot twists to keep character development and action scenes on an equal footing. Listeners will relish the strong female protagonist and Martin’s well-told tale in this series opener.